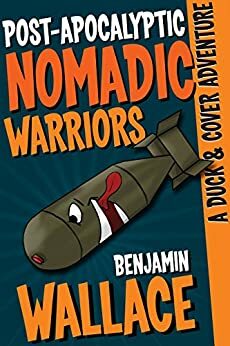 One of my favorite reads of 2016 was a Kindle book called Post-Apocalyptic Nomadic Warriors by Benjamin Wallace. The ad I saw for the book on Facebook promised “Max Max Meets Monty Python.” It was that, and it was much more. It was a truly funny book that gave today’s post-apocalyptic science fiction the long overdue parody treatment it deserved. I recently contacted Benjamin Wallace on Facebook, and he was kind enough to answer some questions about himself and his writing journey. If you’re a writer like me who aspires to turn your hobby into a full-time gig, this will inspire you. I never really liked the idea of working. I figured writing would be a good way to avoid that. And people. How did the idea for the Duck and Cover series come about? The idea of today’s society trying to get by without today’s conveniences made me laugh. We wouldn’t stand a chance, but I don’t think we’d give up either. I saw a lot of potential humor in that. Also the post-apocalyptic genre has been begging for a lampooning since it first came about. What writers inspired your style? Steve Martin’s Cruel Shoes taught me that writing didn’t have to be serious. Joseph Heller taught me that funny could still be respected. E. L. James taught me that you can write like s*** and still find an audience. My writing style was probably more influenced by movies and comedians than any author. Harold Ramis, Pat Proft, SNL in the eighties, the Simpsons, Buck Henry and the list of legends would just kind of go on. How did you approach the marketing of your books? With a great deal of frustration. I spent a lot of years in advertising and expected that traditional approach to work. But books are different. Funny books are different still. What works for the thriller genre or romance doesn’t plug a play with humor. It’s taken a great deal of experimentation and twice that in swearing to start seeing some real results. Did you use more social media or traditional ads to spread the word? Traditional ads (print, TV, radio, etc..) are cost prohibitive to most indie authors. And, in my opinion, not as effective as they once were. I don’t pretend to understand my kids, but they don’t watch TV. They watch youtube. I can’t say they’ve ever held a magazine or newspaper. They stream their music. They don’t listen to the radio. Twitter worked great the first year or so. Facebook is the flavor of the month now. But, any small change can upset a strategy based on purely on social media. Algorithms, trends, terms of service. Things change. And they change quickly. The only sure strategy is to build an audience through consistent quality work stay engaged, be appreciative. How did you know it was time to leave the day job and live your dream job? I could get by with a combination of books and freelance ad work. It costs more than you think to go to work each day. Job security doesn’t really exist anywhere. There was more earning potential in my books than there ever would be working for someone else. Also, they laid me off. The real trick was getting them to lay me off. That took some doing. What’s the biggest lesson you’ve learned that you could share with other writers? Writing the book is the easy part. But it’s a business and running the business is where the work is. Put in the time and money it takes to market it to your audience. It’s frustrating. And it can feel expensive. Okay, it is expensive. But it’s an investment that will pay off if you write decent books. Or 50 Shades of Grey. There’s a market for everything. If you start thinking in terms of ROI instead of pure sales that will help ease the sting a bit. Read Post-Apocalyptic Nomadic Warriors and the rest of the Duck and Cover series on Amazon Kindle. I have written several science fiction novels over the last seventeen years. I couldn’t tell you where the ideas for all but one or two came from. Each one started with a flash of an idea, but that flash was lost in the hours of writing and revising. I’ve been working on a new one for the last four weeks, and since it’s still fresh in my mind, I thought I would share. Thursday afternoon, November 10. About 4:15 in the afternoon I’m walking back to my desk when an idea comes to mind. What if there was a guy who told every girl who dumped him that somewhere, in an alternate universe, the two of them live happily ever after? What if after saying this to a girl, that same girl from an alternate universe comes looking for him? When I leave work that afternoon I then ask another question: What if she doesn’t come looking for the guy because she loves him? What if she wants to kill him? A few hours later I drive my kids, ages 7 and 9, to the library. I pitch the idea to them, and they start pitching ideas back? (We’ve been doing this since they were babies, when I used to make up stories for them at bed time.) They named three of my main characters. I keep two of the names: Shanna and Angie. About 11 PM I doze off in front of the keyboard. I wake up at 1 AM – and I outline the entire story. In short order I have four main characters and synopses for 29 chapters. I write a few chapters over the weekend, a couple thousand words. I base my main characters on people I’ve known in the past, a technique that always makes developing characters easier. Suddenly, out of nowhere, one of my favorite classic movie stars enters the story. She becomes a key character. She also becomes part of a parody of modern sci-fi writers who lace their stories with 80s references. I’m having a ton of fun. Seven years old, folks. The boy has quite the imagination! It’s slow going after Thanksgiving, but the story progresses a little at a time. I find myself doubling back, fixing holes here and there, adding more back story. A really funny subplot (too complicated to explain here) develops. The further I go, the more momentum I get. I get back to a chapter a night progress. On Tuesday night, December 6, after brainstorming through a number of terrible ideas, I hit on a title I like. It’s different than any I’ve used before, and it’s memorable: DIE MAX DIE. Tomorrow marks the 4 week point. I’m about 2/3rds of the way done. The story has taken some crazy turns, but it’s pouring out of the imagination now. It’s a little frustrating because I’m neglecting other more profitable writing projects to try and finish this one. I keep going because (1) I’m having fun and (2) my kids are really excited about it. Don’t get me wrong. This isn’t a kids story. But it’s also not laced with stuff I don’t want my kids reading. It may be PG, but it’ll engage any age reader who likes a little fun – and funny – in their sci-fi. It’ll also be a quick read. 30K words, if I’m lucky. I could expand on that, I guess, but why? I don’t want to bog it down with fluff. And those 1000 page Game of Thrones epics just aren’t my style. Like most of my books, it’ll be open for a sequel. Not that it’ll happen. The story will have to be there and be at least as much fun. First things first: I’m shooting for a Fall 2017 release, and I hope all of you will love it. There are fewer and fewer independent bookstores still surviving in the Internet age. The ones that remain, however, are by and large pretty darn awesome. Karen’s Book Barn is one such place. Located on Main Street in the historic district of LaGrange, Kentucky, Karen’s Book Barn is a little shop filled with books and bursting with character. It’s a book lover’s dream from the moment you walk inside and feel the creak of the old wooden floor beneath your feet, and the shelves are jammed with used – sometimes vintage – books of all genres. Karen’s is now owned by a trio of book lovers including a published author and a former publisher. They are extremely friendly to independent and local authors, and their calendar is jammed with special events, book signings, and more. They also offer special editing services to authors who want to get their books ready for market at a reasonable price. If you’re in the Louisville or Southern Indiana, Karen’s is worth a visit. And if you’re an author in the region, you need to drop in and introduce yourself. Kudos to the owners at Karen’s Book Barn for all they do to keep reading alive, and thank you again for the opportunity to read on Sunday. Looking forward to many returns! Can a book be haunted? Is it possible for a curse to be transferred from real life to the printed page? That question has led a number of readers to the writing of Rick Kueber. Rick is a talented writer from Southern Indiana and a fellow member of the Tri-State Playwrights and Screenwriter’s Project. He is equally adept at writing science fiction and I’ve enjoyed what I’ve read (so far) of his Convergence Saga, but it’s his true life supernatural writing that has made him a top seller on Amazon.com. Forever Ash has been atop the Supernatural and Horror best sellers list on Amazon throughout 2016. 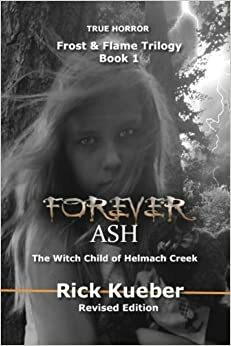 Based on true events, Forever Ash recounts the story of a paranormal investigation that Rick and a team of experts undertook in the Appalachian Mountains. It’s a story that has drawn rave reviews from readers on Amazon, and more than a few readers have related some mysterious happenings that took place while reading the book back to the author. Rick recently appeared on the Into the Paranormal podcast, and he’s made a number of appearances signing books and talking about his experiences as a member of the Evansville Vanderburgh Paranormal Investigations team. You can follow Rick on Facebook, or cut to the chase and discover his books on Amazon.